For the animal owners amongst you, ticks are an all too familiar problem at this time of year. Found in woodland and areas with overgrown vegetation, they start off as small spider-like insects, virtually invisible to the human eye. Ticks can’t fly or jump but they can climb onto your clothes or skin if you brush against them. Once latched onto flesh, be it animal or human, their bodies quickly balloon with the blood they’ve sucked in before eventually dropping off some days later as an engorged, grey ball. But as ticks are very small with a painless bite, you may not even realize you have one attached to your skin. Hard to believe then that such a tiny creature can be the carrier of a potentially devastating disease. While some ticks are completely benign, increasing numbers, especially in parts of Europe and the US, are infected with the Borrelia bacteria which goes on to cause Lyme Disease. The first indication is often, but not always, the bite mark which becomes red, swollen and tender. 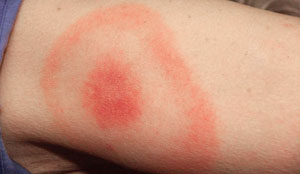 As the bacteria takes hold in the body, a reddish ‘bulls-eye’ rash develops around the original bite, usually between 3-30 days after being bitten. Some patients develop several rashes on different parts of their body. However around one in three sufferers won’t develop a rash at all. Meningitis caused by inflammation of the membranes surrounding the brain and spinal cord: key symptoms in this instance would include severe headaches, neck stiffness and increased sensitivity to light (photophobia). While some of these symptoms will gradually improve with suitable treatment, a few Lyme Disease patients will go on to develop long-term symptoms similar to those of Fibromyalgia or Chronic Fatigue Syndrome, most notably an increased sensitivity to pain, extreme tiredness, muscle and joint pain. Unless a link is made with a tick bite, Lyme Disease is frequently either misdiagnosed, or only diagnosed months after the initial symptoms have surfaced. In some cases, by this point the condition has developed into a potentially dangerous, life-changing condition. This is especially so if the patient has no rash and doesn’t recall a tick bite. 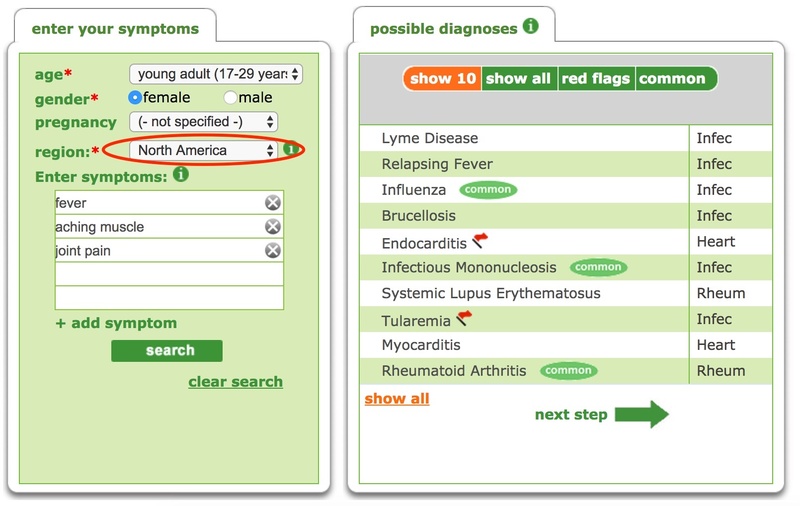 As a first step, you can enter your symptoms into the Isabel Symptom Checker to see if Lyme Disease is included in the Differential Diagnosis list. If you suspect Lyme Disease or know you have been affected by a tick bite, visit your family doctor or GP. Blood tests can be carried out to confirm the diagnosis after a few weeks, however, these can be negative in the early stages of the infection, so you may need to be re-tested if Lyme disease is still suspected after a negative test result. We have published blogposts before now on the importance of keeping a record of your travel history, and this is so important when thinking of Lyme Disease, because it is so much more prevelant in certain areas of the world where ticks inhabit. 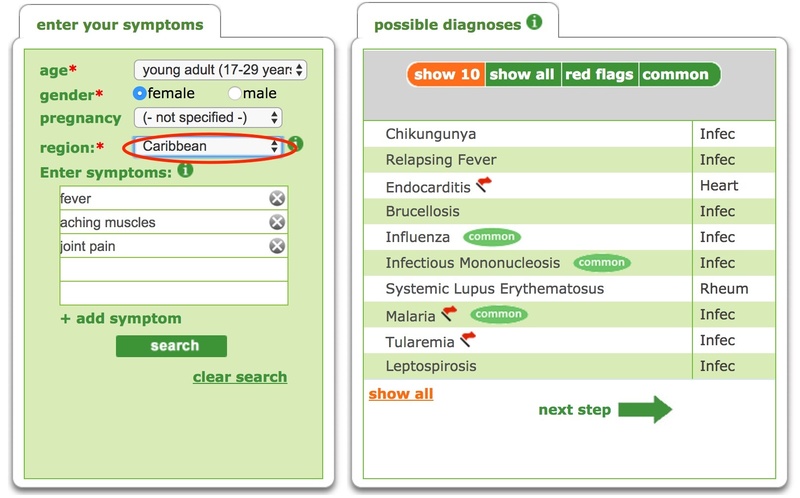 Lyme Disease may not be the first diagnosis to enter a Doctor’s mind until one of these areas is mentioned, and using a symptom checker like Isabel can bring up a different set of possible diagnoses depending on the country entered. For example, changing the region from North America to the Caribbean will bring up altered suggestions, as demonstrated in these two screenshots. Being aware of your travel history could save vital time in reaching the correct diagnosis for many diseases including Lyme Disease. Firstly, if you notice a tick has attached itself, detach it straight away, as you’re more likely to become infected if it’s been attached to your skin for more than 24 hours. The easiest way to get rid of it is by using a tick removal tool available from pet shops. Alternatively, using some tweezers, grasp the tick as close to its head as possible as you don’t want to leave any part of the tick behind as this can lead to infection. Firmly pull it out without twisting the tweezers and then apply disinfectant or anti-septic cream. If Lyme Disease symptoms are present, antibiotics can be administered while awaiting the results of a blood test. Patients receiving prompt treatment usually make a full recovery. If your symptoms are particularly severe, you may be referred to a specialist to have intravenous antibiotics. While speedy diagnosis and treatment of Lyme Disease is key, prevention is better than cure. You can reduce your risk of infection by taking measures, such as avoiding long grassy areas, wearing long-sleeved shirts and trousers, as well as checking children’s bodies and heads for tick bites and checking pets fur. People who spend time in woodland or heath areas in the UK, parts of Europe or North America are most at risk of developing Lyme disease. About 15% of cases occur while people are travelling abroad, another reason to tell your doctor if and where you have travelled.